The content of this website provides a simple guide to the translation of Latin numbers into English. Learn the English translation of all of the Latin numbers into the English language together with examples and the meaning of Roman Numerals. 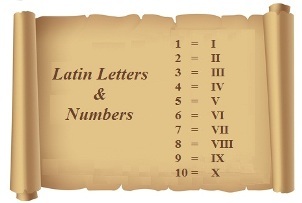 This simple guide to the translation of Latin numbers and Roman numerals will increase your Latin vocabulary and help you learn the words in the language associated with numbers and numerals. Although the language is ancient we still use it in our modern world. Probably the most common example in the use of this ancient numeric system is on many clock faces in which the hours are marked as I to XII. Latin-Roman Numerals are used in English and other modern languages especially in relation to dates. This ancient style of Latin-Roman numbers are also used as version numbers of products e.g. Version II or on reports e.g. Appendix IV. 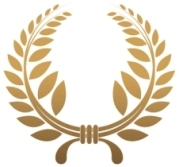 Latin Roman numerals are used for sporting events such as the Super Bowl and the Olympics can also be seen on monuments, public buildings and gravestones. 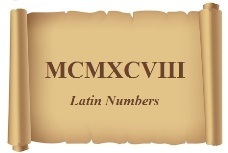 Latin-Roman numbers are used for the copyright dates on films, television programmes and videos, for example the Latin Roman numbers MMXIII translate as 2013. Many Roman numerals are simply added together. Our example of the numbers MMXIII that translate as 2013 as follows: each 'M' stands for 1000, 'X' stands for 10 and each letter 'I' stands for a single number or digit. The use of this ancient numerical system therefore still survives in many walks of everyday life in modern times. King Henry VIII is correct whereas referring to the king as Henry the 8th, or Henry 8, is not! It is not surprising that we look for a simple, free, online translator to enable us to understand the meaning of this ancient numbering system. We have included articles on all the numbers with the translation of the words into the ancient language from numbers 1 - 1000. 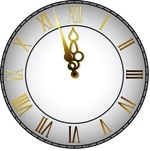 Examples of the Roman numerals for each number are also included. The Latin language and numbering system is still commonly used as part of our English language and vocabulary. Our number system, which is called Arabic numbers, consists of have ten digits from 1-9 and 0. We use all ten numbers to count to nine, then we combine them to make bigger numbers. 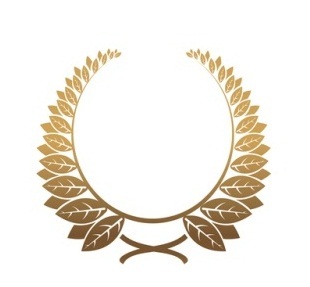 The ancient Romans repeated symbols, so number 1 was I and number 2 was II. The ancient Romans did not use a zero. For larger numbers, the Romans invented new numeric symbols, so number 5 was V, number 10 was X, and so on. 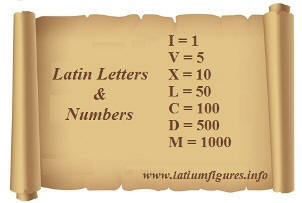 Latin Numbers & Roman Numerals - Seven Simple Letters! Roman numerals are a simple, numerical system that is composed of just seven letters. The letters are, in this order, from lower to higher: I, V, X, L, C, D and M. Roman numbers, or numerals, are formed from traditional combinations of these seven simple letters or symbols. Each letter, or symbol, represents a different number. How to remember the Symbols and Letters! The following helpful tip will help you to remember the symbols and letters used in the old numeric system. "My Dear Cousin Loves extra Vegetables"
The origin and history of this old classical numbering system was not documented by the historians of ancient Rome, however they were used by the Etruscans. The Etruscan numeric system was adapted from the Greek Attic numerals that provided the ideas for the later Roman numerals. The most obvious explanation of its origins is probably due to their counting system that was originally based on a counting method using the fingers. A single stroke of the pen would represent one finger and this translated to the number I. The additional letters used in the numerical system is based on the old word 'centum' meaning 100 and the word 'mille' meaning 1000 thus giving the numerals C and M.
The interesting facts and information about this ancient, classical number system provides a simple guide to the translation of each number into the English language. Learn the English translation of all of the numbers into the English language together with examples and the meaning of all of the numerics. Find the words and phrases to help you learn the classical ancient language and understand the common phrases that are still used in modern times. An easy translation of every common number up to 1 million.